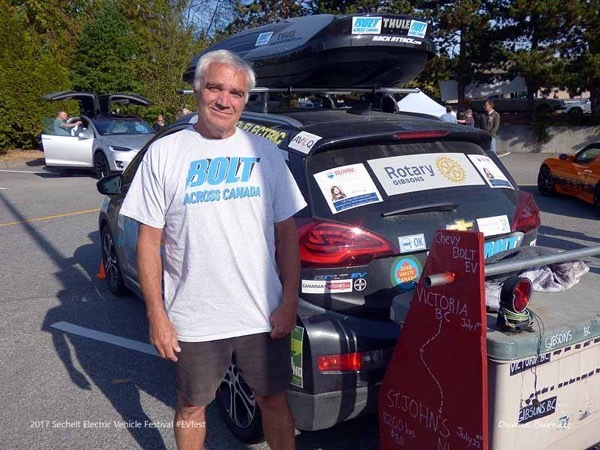 Here on the west coast of Canada, the 3rd Annual Sechelt EV Festival was another big success. While circumstances forced us to abandon our previous waterfront site, the weather was perfect and the new venue (adjacent to our local Farmers Market, a Wood Expo and a local shopping mall, not to mention 4 Level 2 chargers and a DC charger, within a few feet) made this the biggest event ever. All 3 Tesla models attended (the Model 3 doesn't count since they're not in Canada, yet!) We also had the usual strong contingent of Nissan Leafs and SmartEVs with many other new models joining for the first time - 4 Bolts, 2 Fiat 500Es, 2 Kia Souls, e-bikes plus not-for-profit groups promoting EV's. A new venue for our third annual EV Festival! Learn about EV's, enjoy the adjacent shopping mall, wander through the very popular Farmers Market and enjoy the late summer in Sechelt! EV owners are welcome to drop by - but it would be great if you could let us know in advance that you'll be joining us to display your car and talk to visitors! Registered attendees report 141,758 electric miles driven.